How has your day been? I just finished watching the movie To the Bone starring Lily Collins and I loved it!! I love how the movie brought awareness to eating disorders and that not everyone develops them to stay 'thin'(I'm not going to release any spoilers). Anyways today's tutorial, I really didn't know what to call it haha. 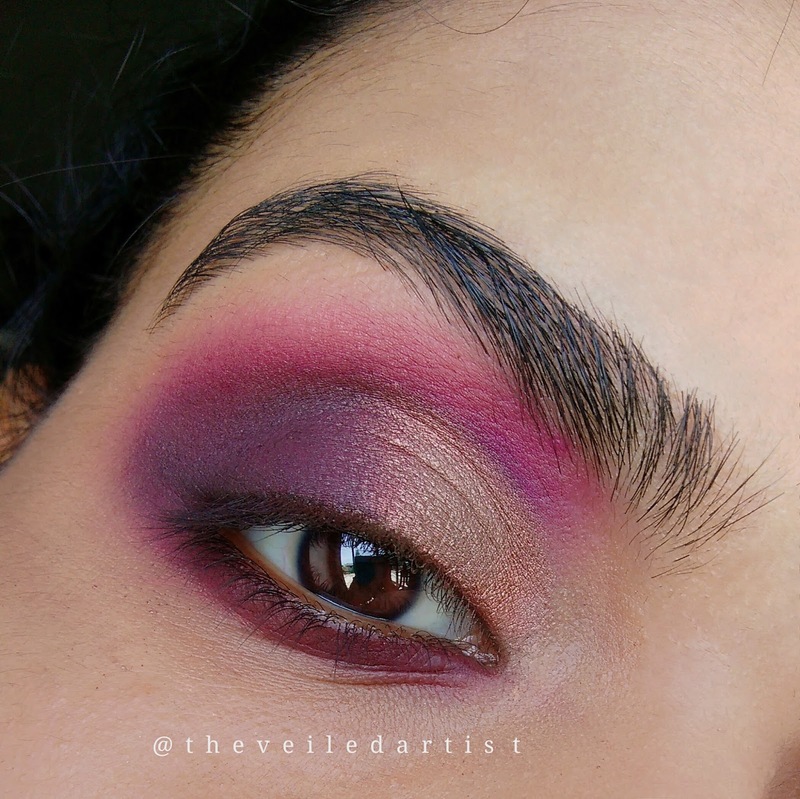 Because it's bronzey but purple but still pink! ALSO! 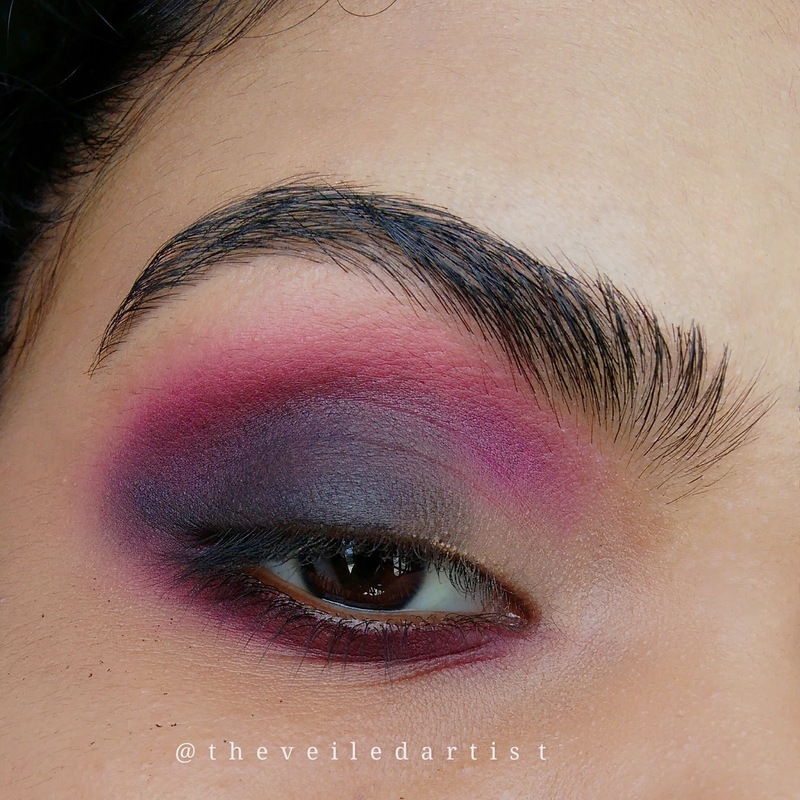 Haha I am well aware that there is nothing 'subtle' about this look as suggested in the title but I meant it's a subtle cut crease and it's not overly defined. Which is kind of how I like it. I feel like this makes it a bit more of a wearable look rather than a clean cut editorial style look. Anyways let's get started with the tutorial! 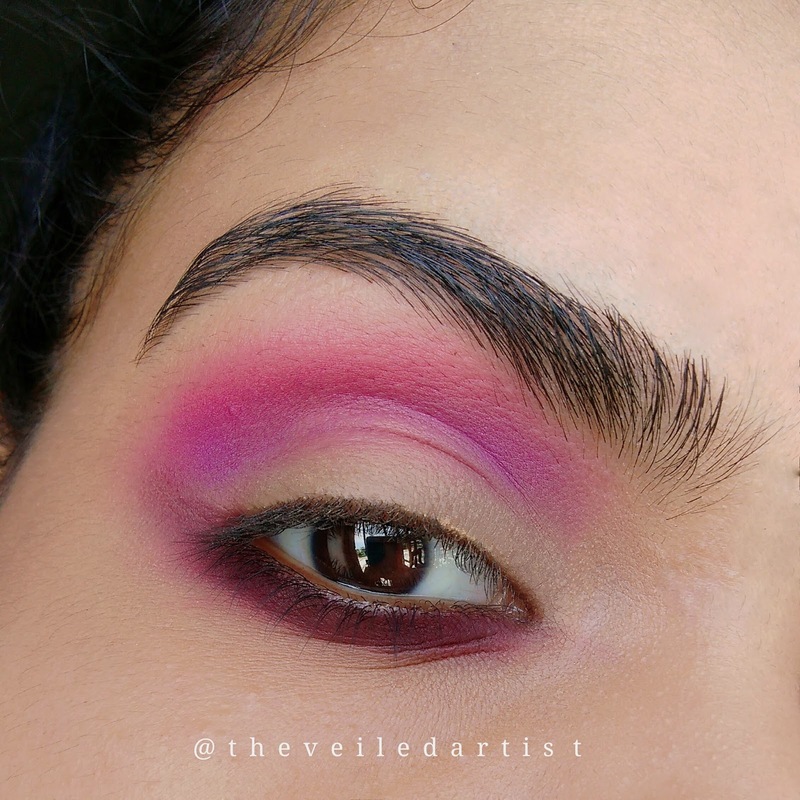 After priming your eyelids, blend the matte pink eyeshadow into your crease and a little above it. 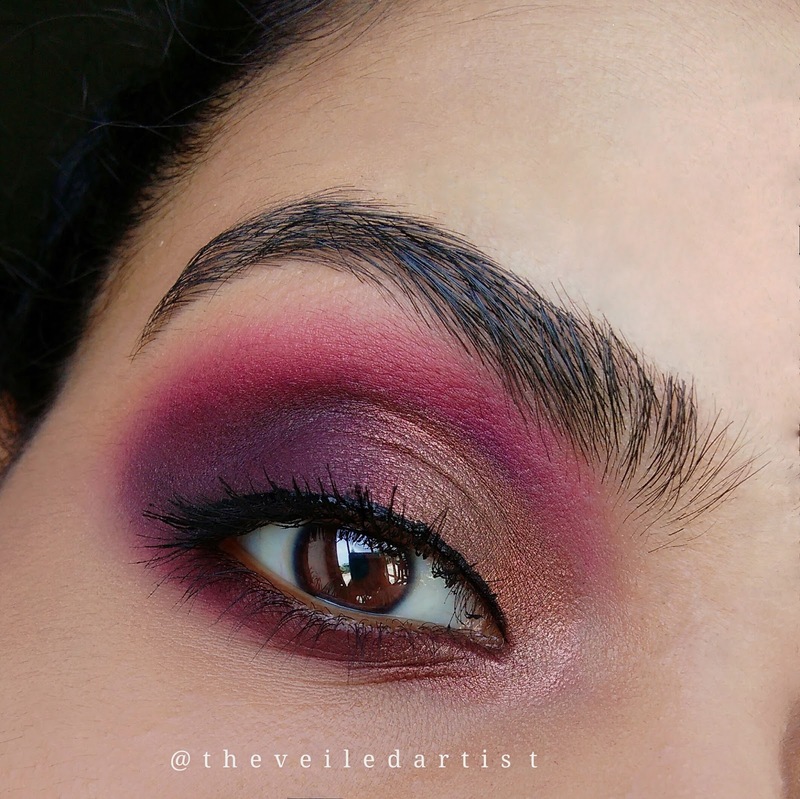 Next, blend the purple eyeshadow directly into the crease but make sure to keep it strictly in the crease and to not blend it higher than the pink we previously applied. 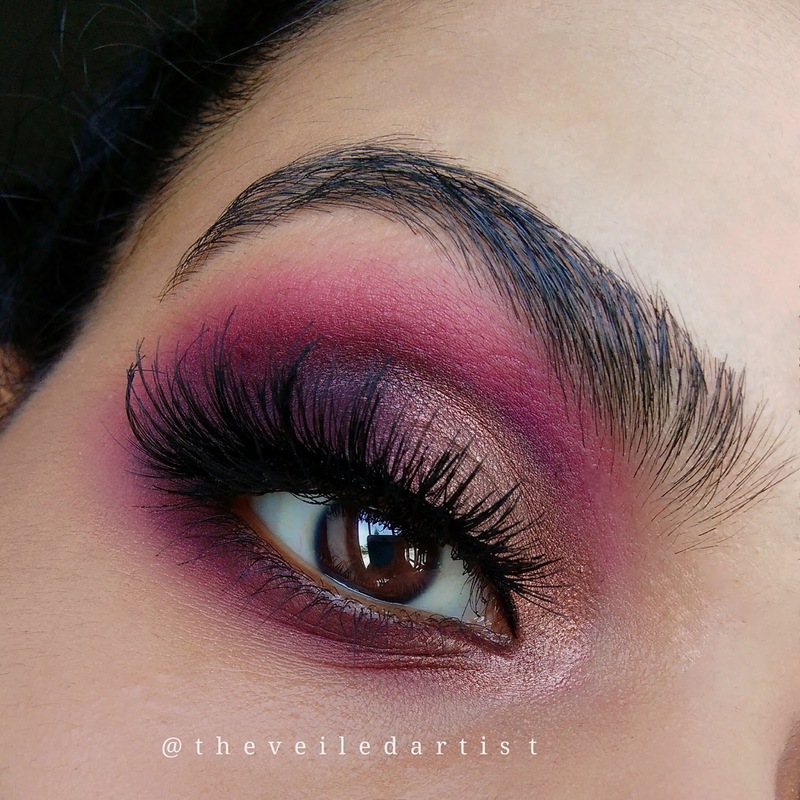 Blend the burgundy eyeshadow all along your lower lashline. 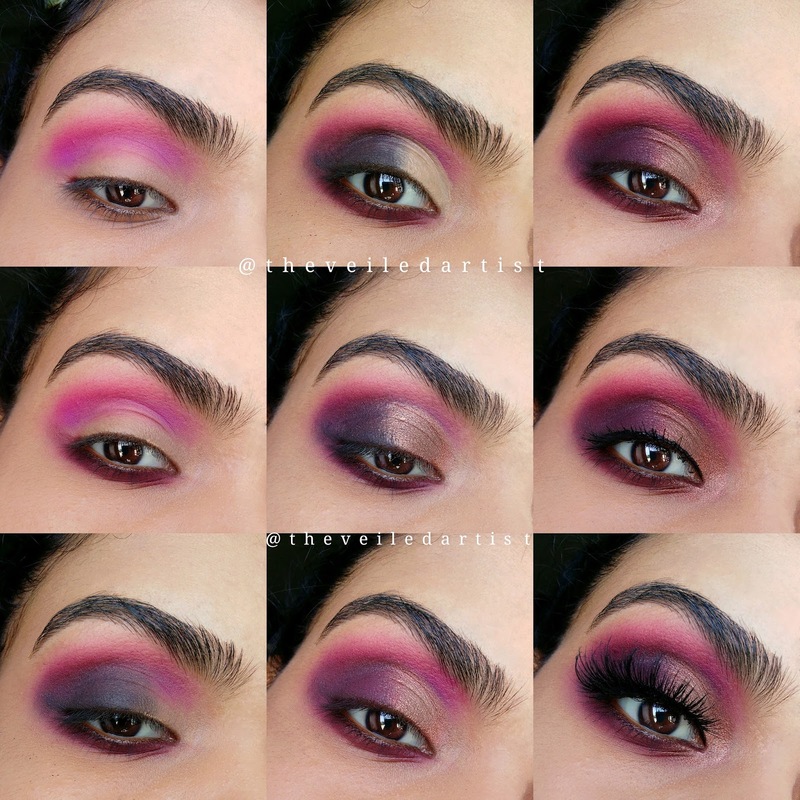 Blend the matte black eyeshadow into the outer 2/3rds of your mobile eyelids and slightly into the pink and purple in the crease. 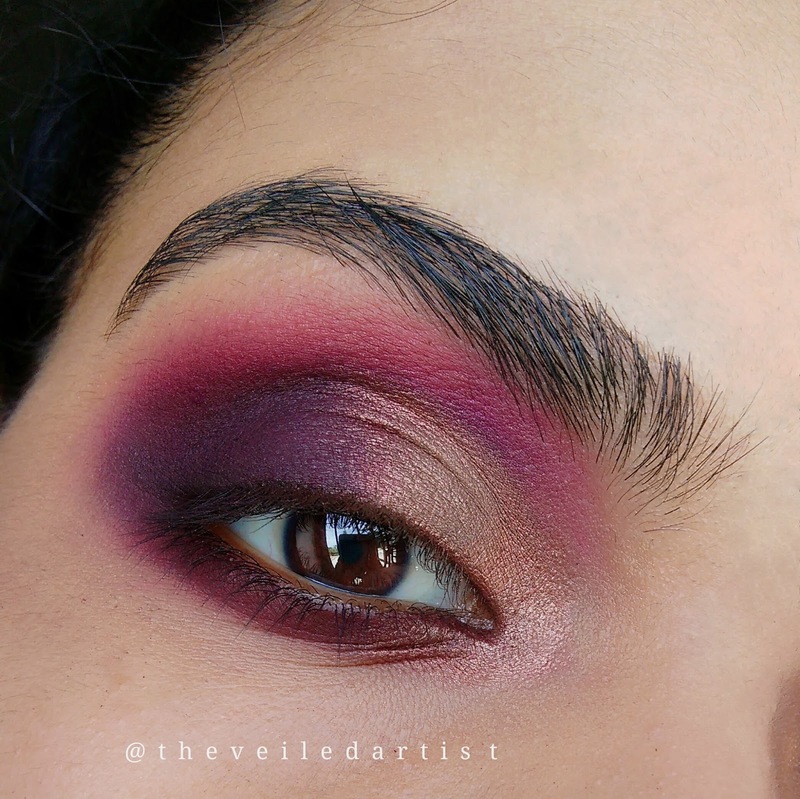 When working with black eyeshadow, make sure to layer and never pick up and apply too much product at once as it can quickly start to look patchy. Using your foundation/concealer or eyeshadow primer, draw a half moon shape on the inner half of your eyes. Make sure to create this a little bit higher than your actual crease so the cut crease lines won't disappear into your actual crease. 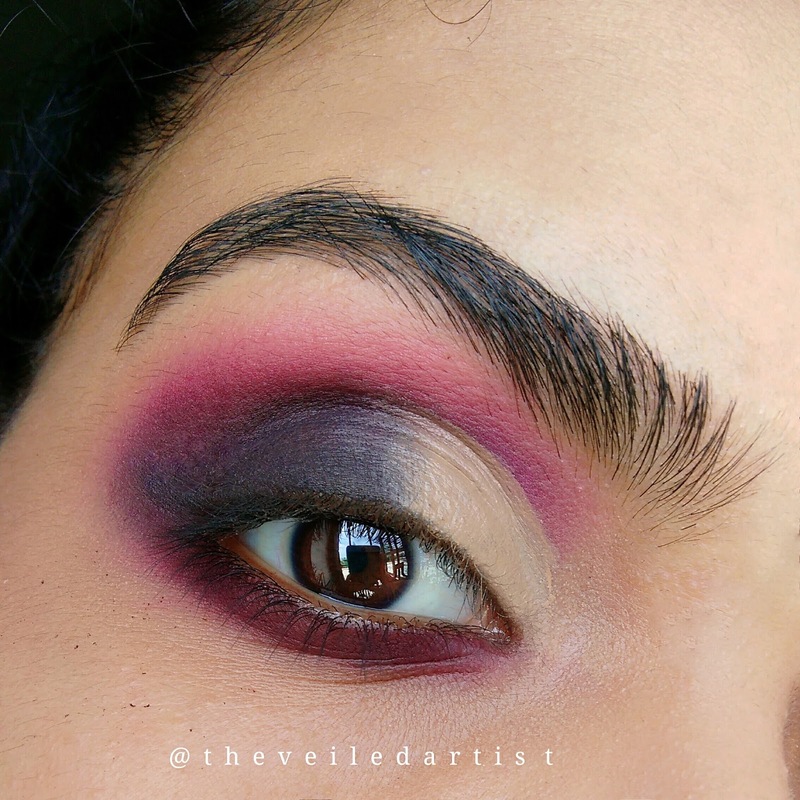 I feel like this look is easiest to create if you have monolids, or small hooded eyelids with a larger space between your eyes and eyebrows! If you used foundation or concealer for the previous step, carefully set the area with a powder and a small eyeshadow/blending brush. Make sure not to move this powder anywhere over the line we just created. This step will ensure that the eyeshadow we apply next will apply evenly and not patchy. Using your finger(as this gives the most pigmentation compared to using brushes), pat the shimmery bronze eyeshadow onto the half cut crease we just created. 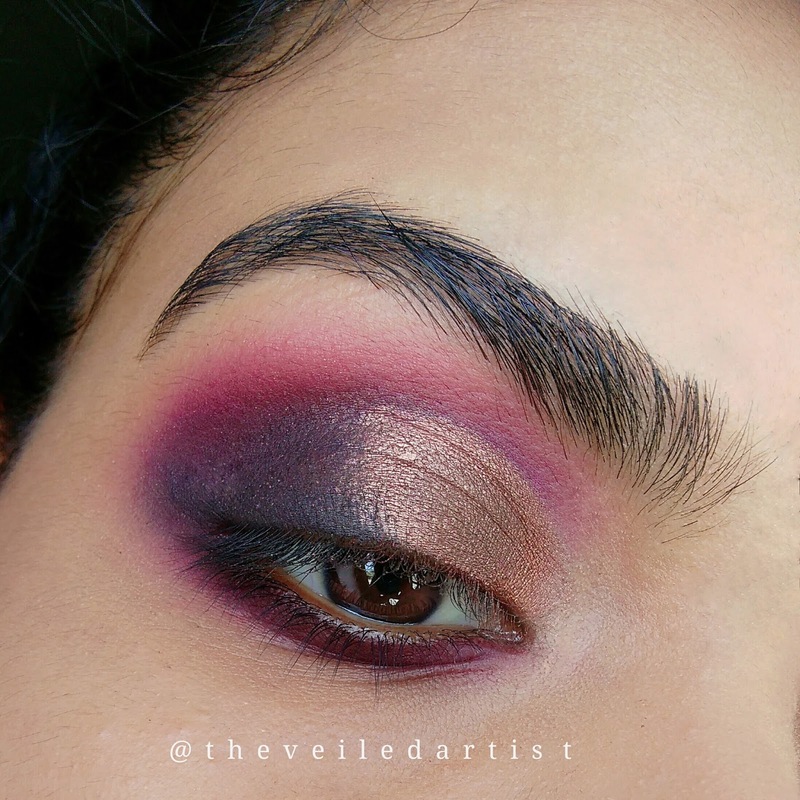 Right above the matte black shadow we applied in step 3, pat and blend the matte purple eyeshadow and make sure to blend this shadow into the bronze eyeshadow as well. Apply the rose gold eyeshadow/highlighter or any highlighter you prefer into the inner corners of your eyes and blend it into the shadows on the lower lashline and the eyelids. Line your upper lashline using gel or liquid liner, but don't bother creating a wing. Curl your lashes and apply mascara. If you don't plan on wearing falsies, you're done with the look! I popped on the Huda beauty lashes in Jade and ahh! They're stunning! And you're done loves! 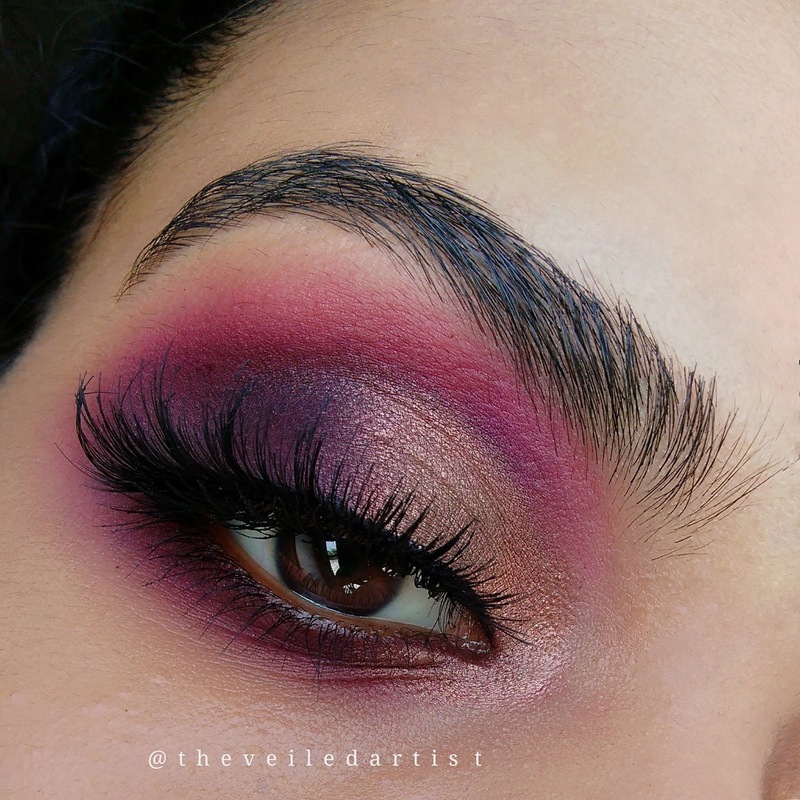 You can even try the ardell wispies with this look because they're not too full and thick and so won't hide all the work you just put in! Scroll down for the pictorial! Thank you so much for reading guys! This might be one of my most favourite looks I've ever created! I tried to simplify the tutorial as much as possible for you to understand and I hope you try and recreate it! 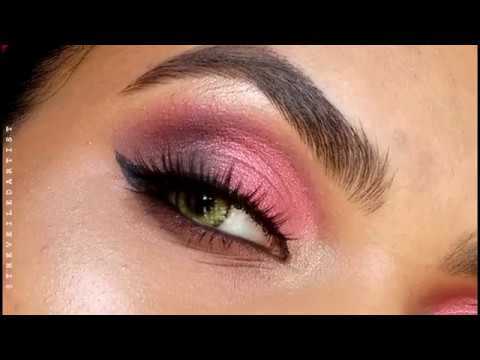 I also recommend you do your eye makeup first while doing this look so you can simply wipe off any eyeshadow fallout and do your face makeup. You can check my last post here. It was a tutorial on shimmery turquoise smokey eyes paired with dramatic liner! Before I sign off this article, I wanted to address the fact that I haven't really done much to my skin during the editing process because I was inspired by a video by one of my favourite youtubers Kaushalbeauty on how everything online is so retouched and that is so true. I retouch the texture on my skin usually because when you take a picture of anyone's skin super zoomed in and focused, there's facial hair and pores and I want the main focus to be on the tutorial! But yeah, I took a break from editing the skin this time. Now, obviously because I'm close to a window, my skin looks a lot more flawless here than it does in person but I just wanted to do this to show you that it's completely normal to have texture and hair and pores on your face.<3 I hope you have a great day and take care!